Halloween is only a few days away – have you got your costume ready yet? No?! Fear not because contributor Timlah is on hand with three of the easiest ideas for the night. Description: Some men just want to watch the world burn – but that quote certainly doesn’t fit the eccentric Timlah. 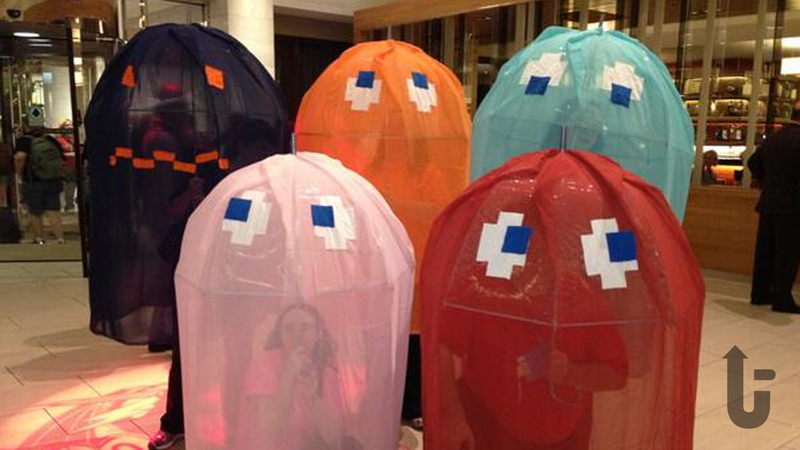 Geek culture has completely consumed this chilled-out cosplaying conundrum. 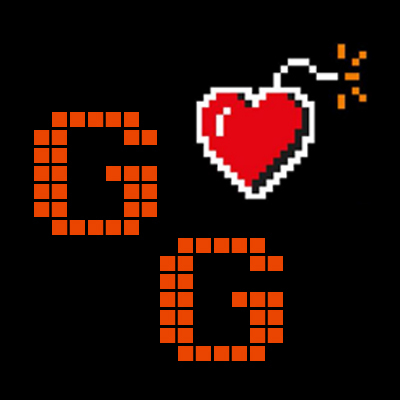 Regularly smiling and keeping it geeky, he’s hugely fond of indie games and alternative gaming systems. Cosplay is immensely popular these days, but how do people find the time to go to conventions? If you can’t afford the high cost of attending these events then Halloween is a perfect time to get a costume together. The ghosts and ghouls will have plenty of fun, but you with your geeky influences can come up with some brilliant and easy outfits to parade around in on Hallows Eve. This is a list of three personal ideas for a quick and easy cosplay. These may have been done before but if you want to get in on the fun; are low on budget; don’t have the opportunity to make a huge costume; but can spare an hour or two – then these are just for you! These can all be gender-neutral, but you have to apply your own creativity to really make these cosplays your own (which I call ‘creative license’). 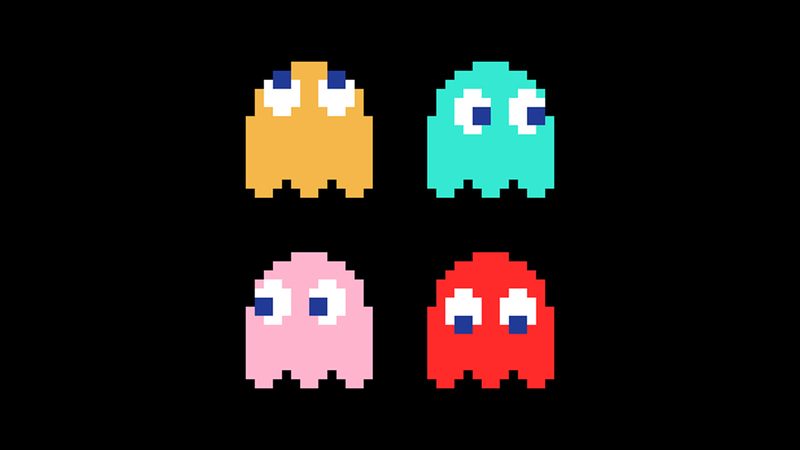 These four ghosts haunt Pac-Man constantly but there’s no reason why they have to be as colourful and as clean as they present themselves. On Halloween, why not consider making one of them but rather ghoulishly evil? Perhaps their constant quest to get the yellow gobbler has finally come to an end and they have feasted on their once nemesis. Simply done, you just need to get a sheet of the colour you need (blue for Inky, red for Blinky, pink for Pinky and orange for Clyde). Measure your whole body, from head to toe, and mark that out times two minus an inch or so (so if you’re 5′ 4″ in height, measure out 10′ 6″). You don’t want the excess cloth snagging on the floor and ruining your perfect disguise! Don’t forget to draw on the eyes: huge, circular and expressive. You can create them in any way you feel but I’d recommend making them look angry and evil. Angry eyes don’t look angry unless there’s some form of brow involved, so don’t forget to put a little flick for the (missing) eyebrows. If you’re a ghost who isn’t Blinky, make yourself some red mist: mix red food-colouring with water for a really simple and cheap effect. Doesn’t take long either! Pour some of the liquid inside of a spray-bottle and have fun spraying up your cloth. If you want to make Blinky scarier, then why not consider adding effects – or if you have more time, create some rips or even missing chunks out of the cloth and use fabric glue to put some black cloth behind it, giving the impression of emptiness? Be creative! It’s hard to make these ghosts scary, but hey: they’re a good splash of gamer-pride in the middle of Halloween and with a little bit of creative license, you’re able to turn a colourful sprite into some ghoulish garments. For the truly gregarious out there, go ahead and make a roll cage of sorts to help retain the rounded shape of the costume. 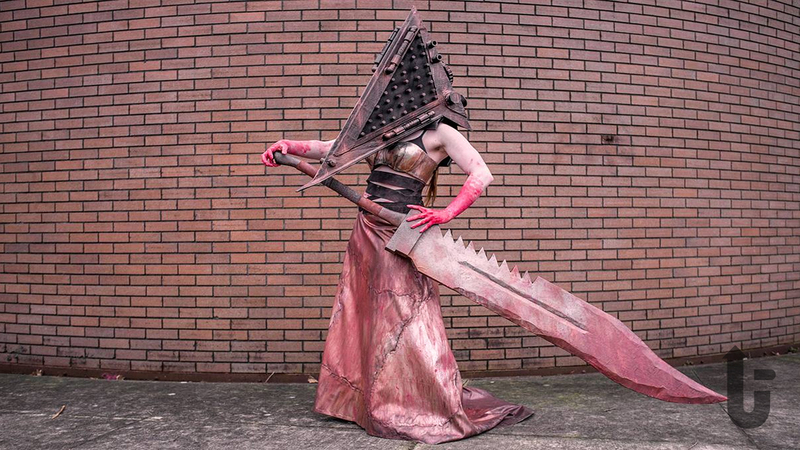 We all know and love Pyramid Head, as brutal and evil as he may be, but he’s a surprisingly easy costume if you’re just looking to put something together quickly for Halloween. With nothing more than cardboard (no joke), some foam and old rags, you’re able to create a relatively-convincing villain – especially if you go to a nightclub of sorts for the festivities. People will recognise the character and will feel that sense of dread bringing them back a few years. First of all, let’s focus on his namesake: the actual pyramid dead. Simply measure out the size of your head and then add some extra dimensions onto it. The issue with this costume is that you will need to determine for yourself how large you need it to be, but a good rule of thumb is to use your head’s height times 1.5 and the length times 2.5. Your head will rest at the back of the pyramid you’re going to make and it’ll droop down. Measure everything out properly and the pyramid should sit nicely in the back of your head. Ideally, you want to measure it so there are some holes for eyes in the right places but trust me: in a costume like this, your vision will be heavily limited anyway. My personal advice would be to not wear it around the place but instead just want to pose or for pictures. The blade is also possible out of cardboard but I’d recommend getting some PVC pipe to go through the blade to keep it sturdy. On top of the cardboard, foam (use the fun foams you can get from hobby stores if possible) and coat it in plenty of gesso or mod podge. With this done, you’ll have a shiny blade, ready for painting and decorating. The cardboard acts as the shape of the blade. 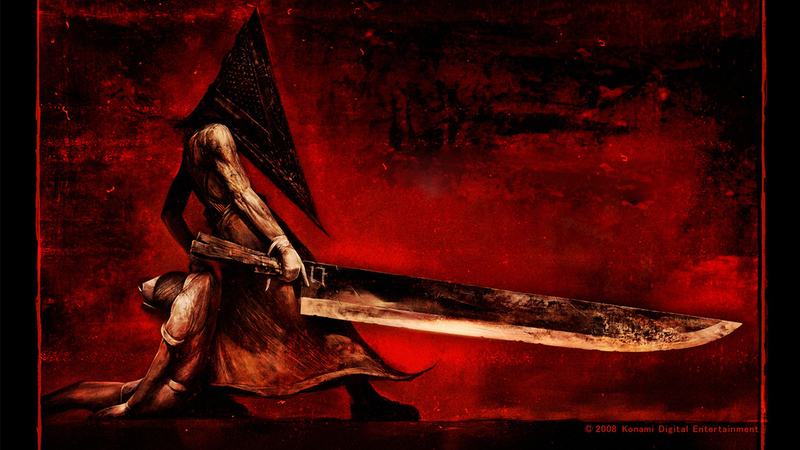 As for the clothes, generally Pyramid Head wears so you’ll need to go and decide what to do for this. Wear some big boots to match and – lo and behold – you are Silent Hill’s most dangerous enemy. Go ahead and strike an excellent pose for people, because you’re going to be the scariest villain at the party! This is the easiest of all of the costumes and it got me a lot of laughs – and more importantly, screams – at Alcon 2014. 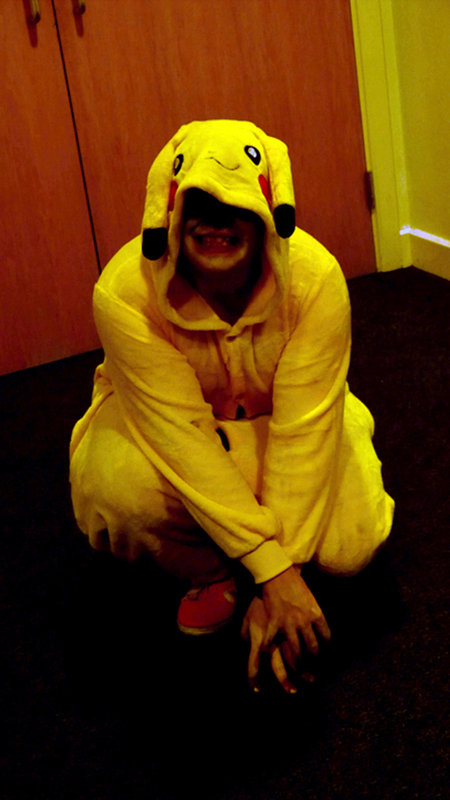 Here’s a photo of me in full make-up wearing simply a Pikachu onesie; There’s nothing special about this costume except that you need black and white face-paints. I have naturally very red lips in general but if you want your mouth stand out more, just buy some red lipstick (yes, even you guys). Of course, go a step further. Take the red mist approach as above, spray it all over your onesie and get some down yourself. Get ‘blood’ over your face (please be careful of your eyes) or even bite into a blood capsule as you turn around to really add to the effect. Make your eyes sunken if you’re going to do this… but hey, it isn’t an exact science. You can also cover your face in something dark (say black swimwear fabric, which has holes that are good enough to see through) and then paint on some large, vicious looking teeth. That way, you’ve got what’s basically a Pikachu with its throat wide open with huge teeth coming towards your unsuspecting victims. Honestly, the more that I think about this, the easier and yet funnier this costume can be!